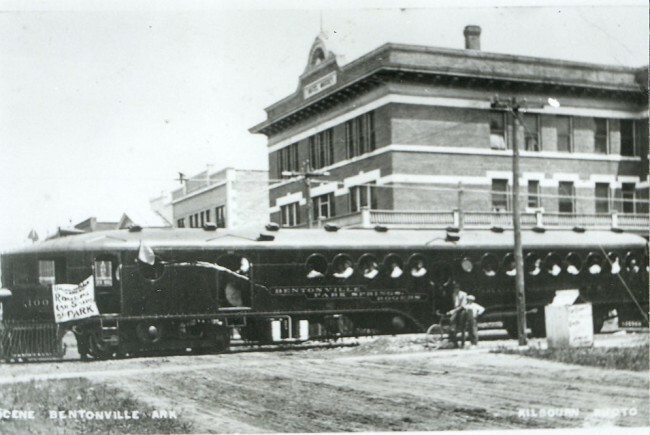 Bentonville Railroad | The McKeen Motor Car Website Bentonville Railroad | The Compendium of Knowledge on the McKeen Motor Car Company, and their experiments. Courtesy of the Rogers Historical Museum. In the good old summertime in the early 1900’s, the highlight of entertainment was a trolley trip in the evening. Young and old alike would take a trip to the end of the line, visit, go to a show, or have an ice cream soda and go back home later that night. Talk of the first trolley in Benton County began in 1912 when a charter was granted to the Arkansas Northwest Railroad Co. to run an interurban train between Rogers and Bentonville. The company got a franchise from Rogers to operate its car down the center of second street from Cherry street north to the intersection with the Frisco track which ran to Bentonville. In Bentonville they left the main Frisco line just west of the Bentonville station. The track curved off the main line and ran north down NW A street. This is now Highway 71, city route. They stopped at NW A and Central to let people out at the Massey Hotel, then went on out to the Park Springs Hotel on the north edge of town. The work was halted several times by injunctions, once by Rogers Light and Water Company and the City of Bentonville, which owned the water system there. Both claimed that the train would disturb their water mains. The court ruled that inasmuch as neither complainant had complied with their own city ordinances in laying the mains at the required depth, and that they had no business to be in the middle of the street, the court would give them no relief. 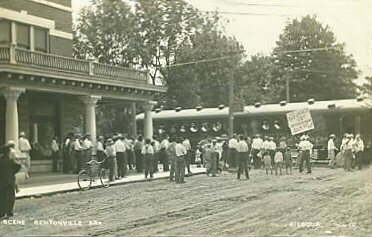 On July 1, 1914, several hundred Bentonville citizens and a band went to Rogers on the first trips of the new motor car, an an informal reception was held. A little later Rogers returned the call and a dinner and picnic was held at Park Springs. The fare was 15 cents at first and the car made several trips each day. The motor car was not always reliable and missed a good many trips. But this was a lot better than having just one run a day like the Frisco made with their train that ran from Rogers to Grove, Oklahoma. 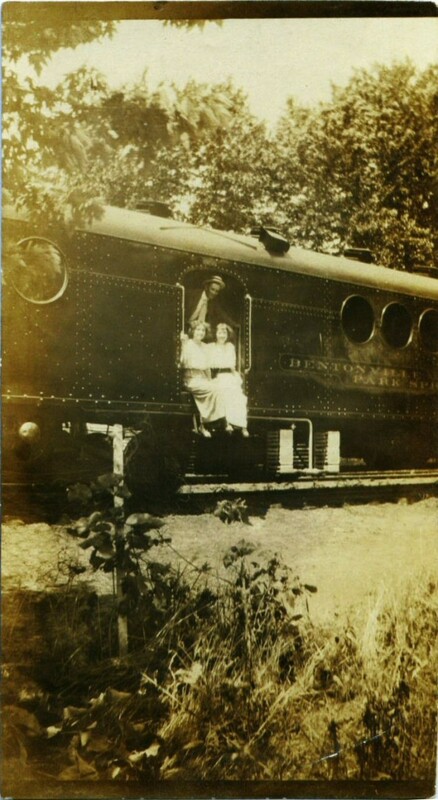 The train was far different from any the people in Benton County had ever seen before. It was a big red coach trimmed in black and had gold lettering. The engine was built in one end of the long coach, and next to this was a small baggage rood. The coach was 72 feet long inside. The passenger part seated about 130(if some some passengers were standing in the aisle) Sometimes there would be standing room only. The line was owned by J. D. Southerland, that is he owned both ends of it. Mr. Southerland came to Bentonville in the fall of 1913, and bought the Park Springs Hotel. At the time it was a large and beautiful summer resort. But it was hard for people to get from the main Frisco station in Rogers to it. 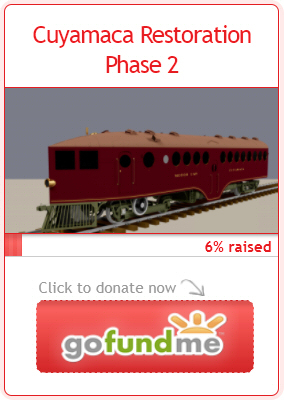 Mr. Southerland made a deal with the Frisco Railroad Line to run his train on their track from Rogers to Bentonville. The only trains they were running was a passenger train to Grove that went out in the morning and back at night. Then a few freight runs. Southerland made his runs between these. Their Roger’s station was just a roofed-over platform a block from the Frisco Station. There was a shop and shed at the Bentonville end of the line, and the train was kept here overnight.